Teenage Mutant Ninja Turtles Splatfest Part 1: Raphael vs. Leonardo! Japan's Splatfests in Splatoon 2 have been sponsored nonsense for basically the whole time they've been doing these, so they're used to Splatfests being dumb and immersion-breaking. 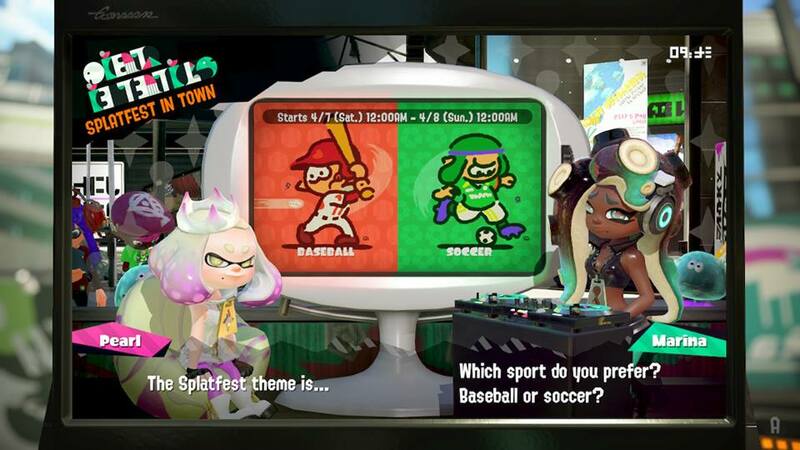 Europe and the Americas less so, not since the bad days of the SpongeBob SquarePants Splatfest in the first Splatoon. However, we're returning to those days. Not just returning. Not just doubling down. 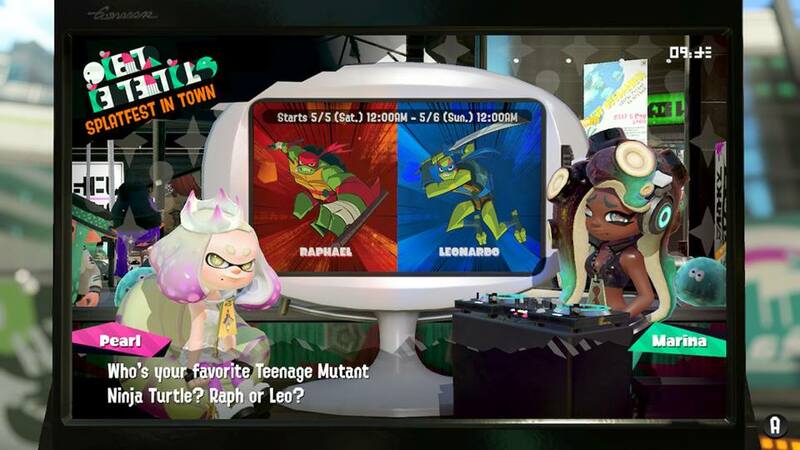 But we're tripling down on them: In the next three weekends, we'll have THREE Splatfests in a row: a tournament style series featuring the Teenage Mutant Ninja Turtles. Round 1, for Saturday May 5th, features Raphael vs. Leonardo. Round 2, for the next Saturday (May 12) features Michelangelo vs. Donatello, though I don't know if that's the order that Off the Hook will support them in. Round 3, for May 19, will conclude the Splatfest tournament by having the winner of Round 1 and Round 2 face off. You'll need to go collect your Super Sea Snails on, like, Sunday. Quick, now. Wait... before I tell you my choice... what the hell happened to the Teenage Mutant Ninja Turtles in those pictures?! By LUDWIG VON KOOPA - All you really need is Super Smash Bros., but Nintendo has that AND MORE! Sunday, June 11 2018: 6:30 PM to 9:00 PM Eastern, semifinals for the Splatoon 2 World Championship Tournament. 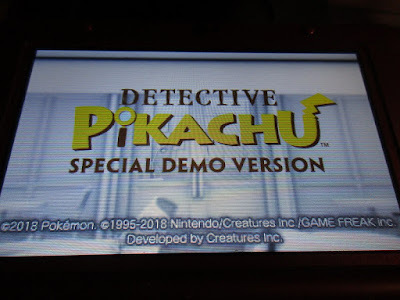 Monday, June 12 2018: 12 PM Eastern, a Nintendo video presentation. Nintendo hasn't come up with a fancy name for it yet. Monday, June 12 2018: Shortly after the video presentation is Nintendo Treehouse Live! They'll begin with Super Smash Bros. for Switch, and are said to focus on just Nintendo Switch games between the 12th, 13th, and 14th. 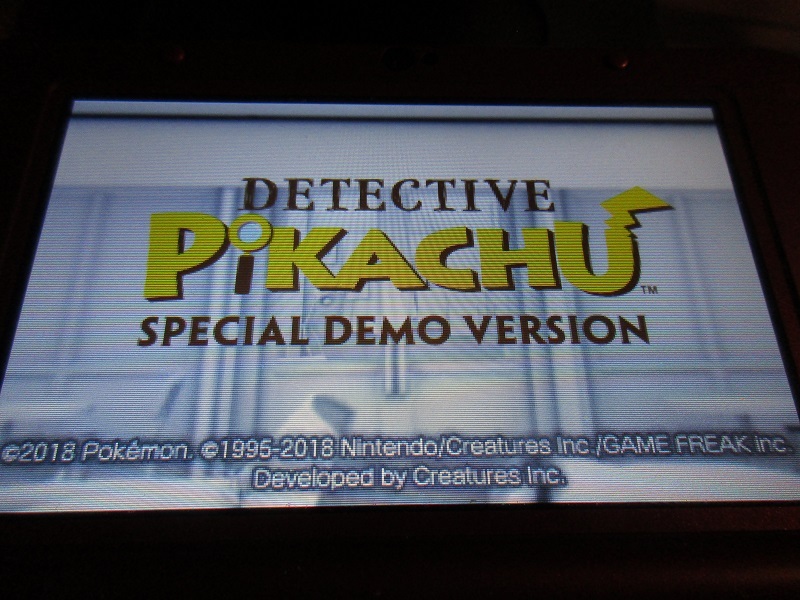 ...They'll probably show some 3DS. Monday, June 12 2018: Sometime at night, there will be the finals for the Splatoon 2 World Championship Tournament. Monday, June 12 2018: Sometime later than that, will be the Super Smash Bros. Invitational 2018. You may remember that we talked about both those E3 tournaments already, a month ago. Clearly, Nintendo's logistics have... made marginal progress. They know what days each tournament will take place, but they don't seem to yet know exactly how that Monday will happen. In any case, when the time comes, KoopaTV will publish its E3 2018 Schedule, along with its new logo. Which part of E3 2018 are you most looking forward to? Is it Super Smash Bros.? It probably is. Too bad for Ludwig that they replaced the whole Best Buy E3 experience from years ago with Nintendo NY Store catering. Compare Nintendo's E3 2017 planning here. By LUDWIG VON KOOPA - As much as was promised. All of those things are in this update (here are the patch notes). Not much else is a part of it besides bug fixes and weapon balancing. I'm not sure if it warrants a jump from 2.3.3 to 3.0.0. The second decimal is for bug fixes. The first is for new features, such as revolutionising Salmon Run (2.2.2 to 2.3.0 — I wrote about it recently and will refer to it in this article, so read up on my thoughts by clicking), or adding a whole new mode in Clam Blitz (2.0.1 to 2.1.0). I guess the non-decimal number goes up when there is new gear in the update. I don't know why Splatoon's developers put that as a greater priority than new features, but there you go. Let's talk about Callie. She appears if you've completed the story mode. By LUDWIG VON KOOPA - When you apply LOGIC to it, the purity test makes no sense. When I read comments sections on forums and the like (but I haven't seen this on KoopaTV's comments section, either because I don't talk too much about it and you're on-topic, or you guys are smart), I read a fair number of gamers complain when game companies start working on post-launch downloadable content (DLC)... before the launch of the game. That's apparently a no-no to you gamers. But if a developer starts working on DLC the day after launch? Suddenly, that arbitrary distinction becomes very meaningful to you... even noble. By LUDWIG VON KOOPA - Not that I really know anything about it, but now I don't ever have to! Meanwhile, three days ago, CAPCOM Game Studio Vancouver announced on Capcom Unity that they are sunsetting Puzzle Fighter, with them shutting down the servers on July 31. (Three months and a week!) 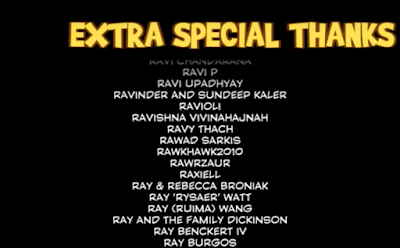 All the content after the 20th, including the game's soundtrack and Dr. Wily, are FREE! ...And in-app purchases are disabled today. 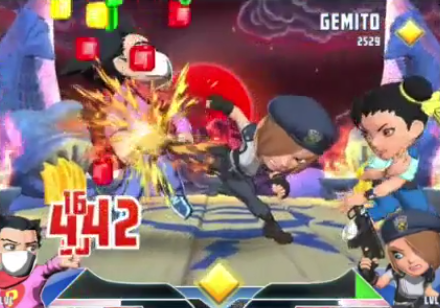 The reason that Jeffery Simpson, the CAPCOM Vancouver community manager, said that they would be ending Puzzle Fighter is so they could focus on Dead Rising. That's admirable, since that's what CAPCOM Vancouver was working on before becoming a CAPCOM studio. Perhaps they were just stuck with Puzzle Fighter and never wanted it. Ludwig hates writing articles about when CAPCOM games put a focus on mobile, so he's more than happy to spend some article space on KoopaTV writing about the opposite occurring. If you have any experience with Puzzle Fighter, perhaps enough experience to actually be upset about it shutting down, feel free to comment about it. Just expect the KoopaTV response to be incredibly unsympathetic. As for Phoenix Wright's pink sweater, do YOU know what the P stands for? Compare this mobile game end-of-life to Miitomo, which has had substantially more time to end than Puzzle Fighter in-between announcement and end. By LUDWIG VON KOOPA - The Nintendo Labo has released today. Don't fall for its trickery. Today, Nintendo released their build-it-yourself-peripheral-toys-to-play-shoddy-software combination, the Nintendo Labo. By... sheer coincidence, of course, today KoopaTV formally declares war against Nintendo Labo and urges all readers to not purchase it. Anyone who has already bought a Labo is urged to return it to your retailer and get a refund. Don't buy the Labo. It's as simple as that. That isn't... much of an article, so let's review what got us to this point, and why exactly the Nintendo Labo endangers the lives of you and (your?) children. By LUDWIG VON KOOPA - Don't let horrific recent events bias your opinions. She didn't fly out the plane, but she did die anyway. This is understandably spooking people who would want to fly planes. Then people think about United Airlines and that guy being dragged off the plane even though he paid for his seat already. These scared people are turning to long road trips by car as an alternative... or even worse, by train. (If you're worried for your safety and sanity, DON'T RIDE TRAINS!) Or... even worse than that... BY BICYCLE. PLEASE DON'T RIDE ONE OF THOSE! While I can't address customer service in this article (there aren't statistics on how rude taxi drivers are, or how many Uber drivers are rapists and murderers), I can address safety. Planes still beat cars in that regard, and are still better than cars for all the reasons I discussed in that Splatfest article in the first paragraph. By LUDWIG VON KOOPA - The Splatoon 2 version that changed the Salmon Run experience forever. Almost six months ago, I received a request from an anonymous reader asking me to write about Splatoon 2's most fun mode, Salmon Run. Obviously, I didn't feel a rush to take the request, but eventually I realised it was worth commentating on the topic, especially my thoughts on the difference between Salmon Run before Splatoon 2 version 2.3.0, and Salmon Run after Splatoon 2 version 2.3.0. So if I ended Saturday's Salmon Run at 400, then next time I play Salmon Run, I'll start at 400. Beforehand, there was mandatory scaffolding where you'd start at 40 and you'd get used to the unique weapon set for the rotation and how that goes with the map. Now, you better be ready from the first time you play that rotation, or you'll drop in rank. You might drop to 380 and never win again, so you'll start the next time at 300. It creates pressure to keep playing past the DAILY SUPERBONUS. By LUDWIG VON KOOPA - We discuss the Friend Pass, and why EA is even funding this game. Their founder, Josef Fares, is a coarse jackass, judging from his appearance at The Game Awards 2017. They were making and have now released their two-player mandatory co-op game, A Way Out. A Way Out was actually very memorable from the Electronic Arts E3 2017 press conference. I cited it as the “most cool, innovative concept from EA's conference”. Usually I don't remember random games from E3 conferences I don't care about, but I remember A Way Out. 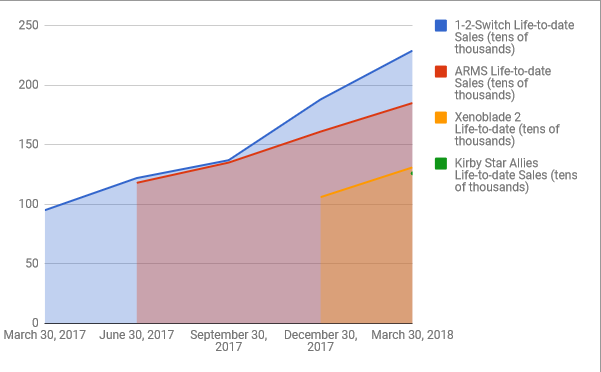 Well, it released at the end of March, and has since sold over ONE MILLION COPIES. I take issue with Mr. Fares's math, claiming that two million people have played A Way Out. By LUDWIG VON KOOPA - This answers what is going to happen with KoopaTV and KoopaTV's stuff. After yesterday's proclamation, even though it happened on April 1 and not in March, it's probably best to talk about it to start this March 2018 newsletter. Yesterday (on a SUNDAY, so you know something is unusual), there was an article published by what appeared to be King Bowser Koopa, describing how KoopaTV would be ending, to be replaced by a new website, LaboTV. It turns out that this change in strategy did NOT come from our chief executive, King Bowser Koopa. It came from a cardboard imposter, Trojan Bowser! Could it be that the forces of cardboard are teaming up to try to take over the Internet in order to promote the Nintendo Labo? Well, while we could not get in touch with the real King Bowser, we can be assured that Trojan Bowser is nothing but a fake. 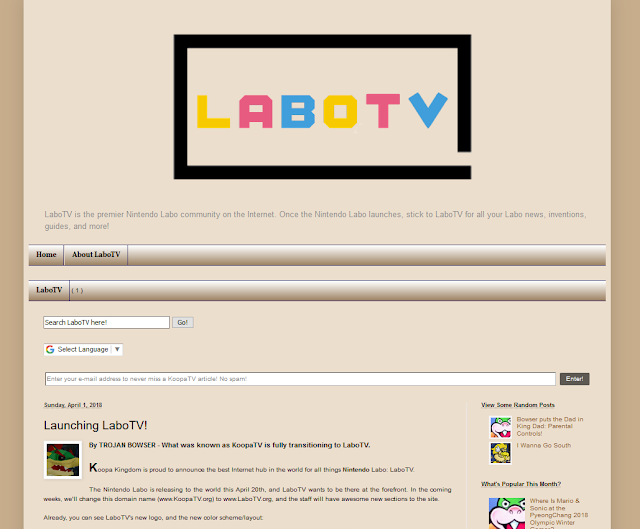 By TROJAN BOWSER - What was known as KoopaTV is fully transitioning to LaboTV. Koopa Kingdom is proud to announce the best Internet hub in the world for all things Nintendo Labo: LaboTV. The Nintendo Labo is releasing to the world this April 20th, and LaboTV wants to be there at the forefront. In the coming weeks, we'll change this domain name (www.KoopaTV.org) to www.LaboTV.org, and the staff will have awesome new sections to the site. LaboTV will keep you in the know for every bit of news that happens in the Labo world, straight from Nintendo! Or if any other company has news, then that will be just as valid, but also fact-checked. LaboTV will showcase your creativity by displaying the cool, novel uses for the Labo that you come up with! This includes the awesome things you'll make in the Toy-Con Garage. LaboTV is also very interested in how you use your Labo as a lifestyle decision. Are you raising your kids with Nintendo Labo? Have some cool pictures or videos with you using your Labo? Anything with you and the Labo, we want to know about! For the software that comes with the Nintendo Labo Kits, LaboTV will dissect everything you can do in these interactive experiences, as well as any optimal decisions you may need to make. These guides will be multimedia — text, pictures, and yes, videos. Broke your cardboard? Well, LaboTV will take submissions for any CAD (computer-aided design) files you may wish to share. LaboTV is agnostic as to what file formats you submit, but neutral STEP or IGES files will likely have the most impact with the general audience. With those, you could even 3D-print a good-as-new Labo! LaboTV is even prepared to compensate you for your designs! We thought about converting KoopaTV's Intranet website and old forum, Planet Koopa, into a LaboTV forum for all of you to enjoy, but forums are on their way out anyway. We will be opening a public LaboTV Discord server once LaboTV opens because we want to be the premier Nintendo Labo community, and Discord servers are the modern way of doing that. KoopaTV's staff will be moving full-time to support LaboTV. When I write full-time, I mean it. LaboTV will be funded by a Patreon, as well as advertisements. We anticipate a LOT more traffic — traffic that can be monetized — with LaboTV than we ever did KoopaTV, so it will actually be able to self-sustain without infusions of capital from Koopa Kingdom's treasury. We hope to be able to support your love of Labo. KoopaTV's articles will be archived on a read-only domain once it becomes May 6th. The KoopaTV Loyalty Rewards Program Round 19 will be allowed to conclude at the end of April and its winner will be honored with the prize, the $10 Nintendo eShop code. The KoopaTV Loyalty Rewards Program will then conclude, and LaboTV does not plan to have a comparable replacement. We're going all-in with the Nintendo Labo with LaboTV. It's a new chapter in the staff's lives, and we hope you'll enjoy LaboTV as much as we will. 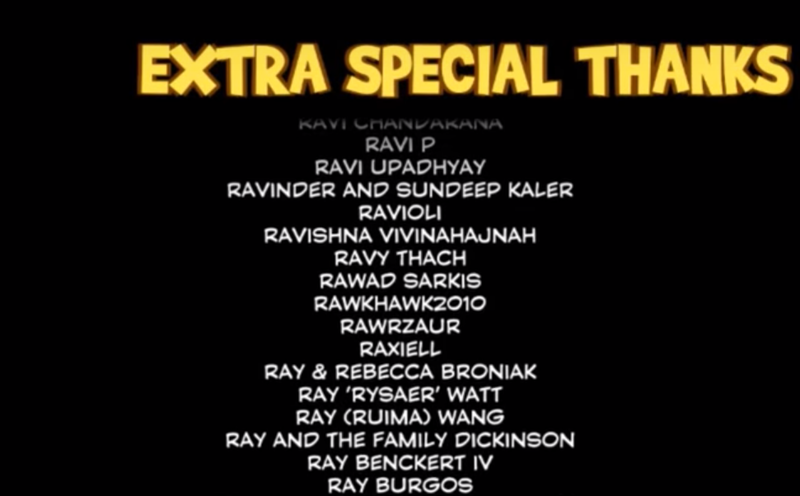 These footers won't exist on LaboTV articles. Just a heads-up. It turns out that Trojan Bowser is a cardboard imposter, and LaboTV isn't King Bowser's true wishes! LaboTV is canceled, and KoopaTV is saved! Because of the unforgivable act of pretending to be King Bowser and trying to end KoopaTV, KoopaTV has declared war on the Nintendo Labo. The Labo cannot build cardboard constructs where there aren't any. A whole group built TROJAN BOWSER. It's time to go heavy weapons on the Labo. We can conclusively prove that Labo and Mario are teamed up. The Labo was responsible for a whole train outage. The shipping industry is responsible for the proliferation of Labo into homes and businesses.